Here are the hour glass units that are done so far for Kutarug. I have these six color families going. I'll be heavy with the green, blue, black, and purple...not so much on the warm colors. I have been preparing them in stages. Frankly, as I have said previously, there is no idea on how many will be needed. These are stitched all except the last seam putting the pair together. 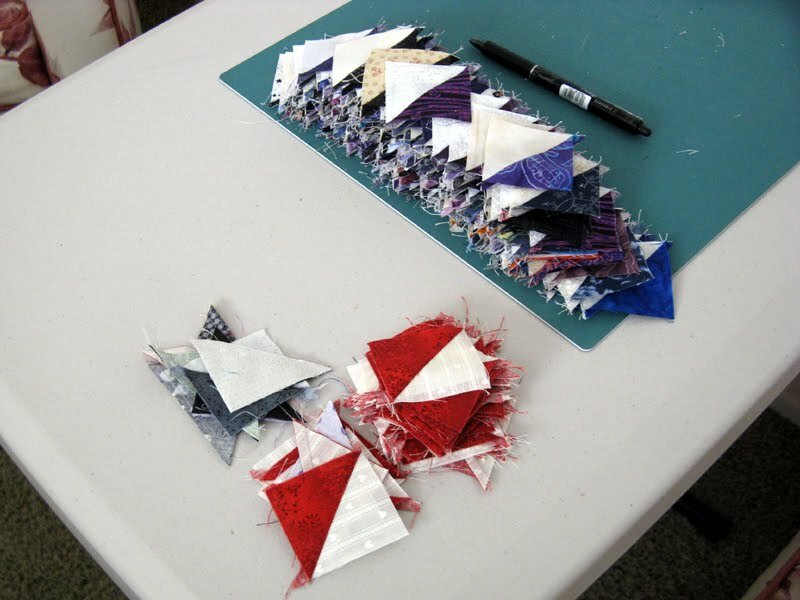 These are the HSTs that are the driver for this project. 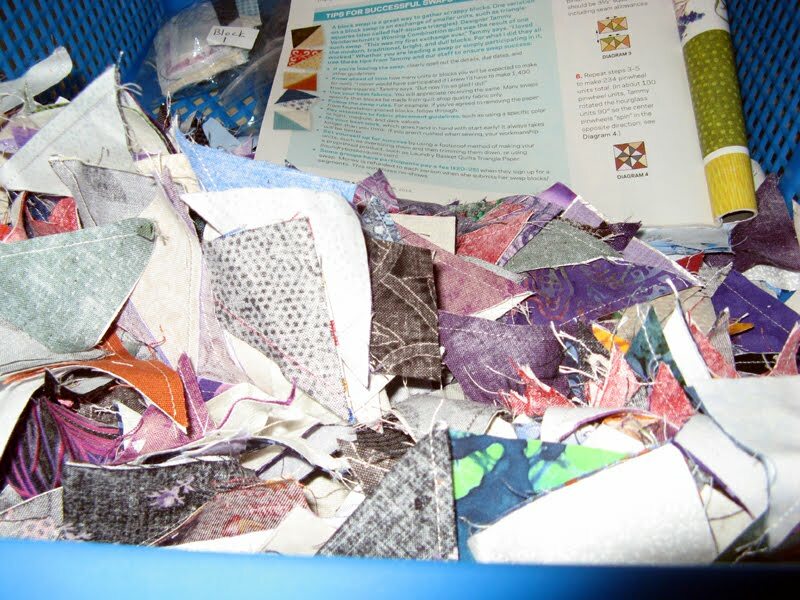 All of these HSTs have been seen the iron. A few have been made into the 1 1/2" hour glass units in wait for a bit of variety with units yet to reach this spot. This entire stack has been finger pressed, awaiting the iron before matching up into pairs to get to the put into the hour glass units. Although I do not have a photograph to show any waiting to be trimmed...there is a stack of them too. Definitely lots happening to move me through this UFO. Of course, it will not be finished by month's end so there are two possible substitutions in wait for the September UFO announced to take August's place. This week once again nothing to change my stats. I did get a some things done though. My trip to the East Coast changed with the onslaught of Hurricane Harvey. My trip to Orlando put me through Houston and Austin just before Harvey was to hit land. I decided best not to chance anything. The airlines had made suggestions that anyone traveling from Thursday through Sunday through the path could cancel or change their flights without penalty. So I took it. Changes to have me go straight to my parents at the late date were just too much. So a later time this year will be arranged instead. 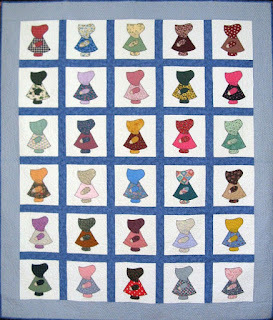 Tiffany's Sunbonnet Sue quilt is finished along with the two pillows. Only a label remains. The blocks with the exception of a few were made years ago. This year when mom visited a setting and assembly of the top started. Now it's done to the delight of mom and Tiffany. 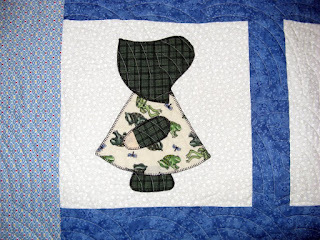 My favorite Sue has to be this one with the frog and plaid fabric. There is still more painting to be done, but here's a peek at what kept me busy much of Friday and Saturday before the sun came out. 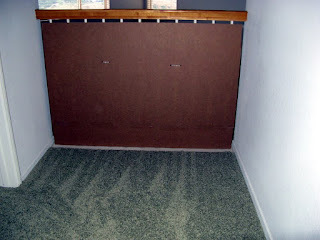 The wood loved the new paint so much that more than a gallon will be needed to finish. I got about half way finished before running out. Home Depot is on my list to get to during the week. 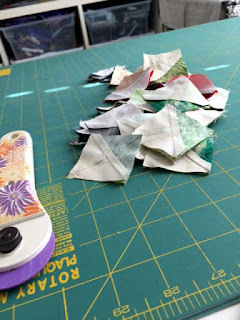 I am a long way from having the August project complete, but work on it I am! I haven't yet found the fabric that will replace the pink you see. Once I have found the right blue a maize color will be selected. 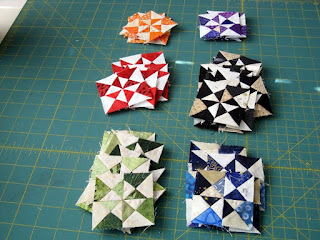 Until that time I am working on the pinwheel blocks. These are the bonus triangles that I have been using. 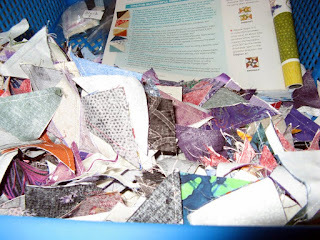 This group comes from the huge bag Debra gave me a few months back that will work for Kutarug. For now I'm working on purple. These are in the hour glass unit waiting for trimming to 1 1/2". Pressing is a must to get these to nest correctly for the next steps. Here I have the 1 1/2" units sewn into the pinwheel block. Pressing again! These are the finished units. No other colors will be added, but there will be the purple and lots of these. 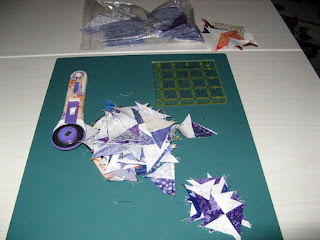 Presently I am calculating around 500 pinwheel blocks to make the king size quilt that is planned. 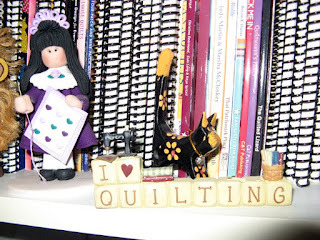 Yes I Love Quilting! Have a terrific week...and protect your eyes today if you plan to gaze at the eclipse. 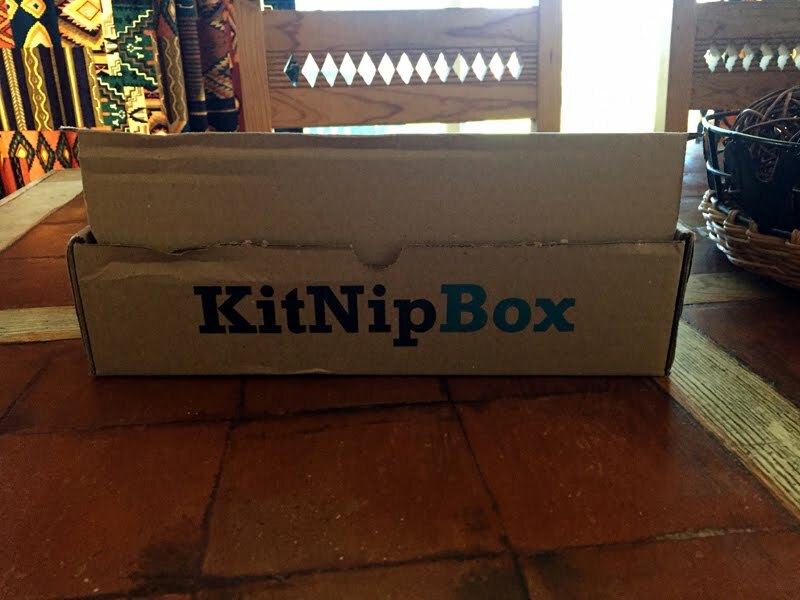 Today my stash usage is all about repurposing cardboard. 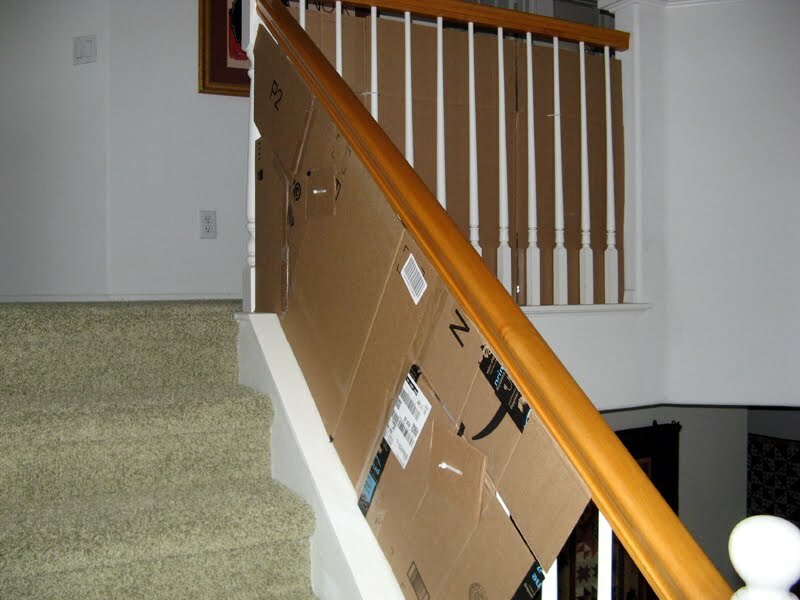 I've been holding on to several large box shipments knowing that kitty proofing the second floor railings was a must. This is the second floor hall landing. 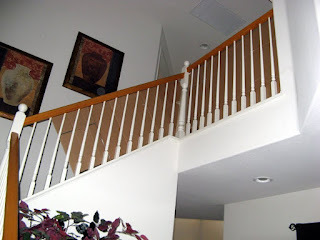 This would be the harder landing as the floor below is hard wood. 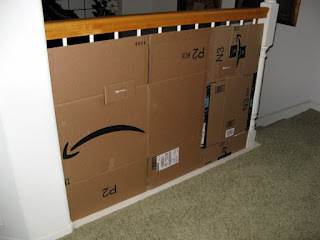 I will be playing it by sight once they arrive if that one last area to the left needs more cardboard! This is the area that Kaos and Komotion both tried once. Fortunately neither of them needed veterinary attention. I usually have a quilt rack on the right, but that would only add to the ease of climbing up and over...which is definitely a big NO! 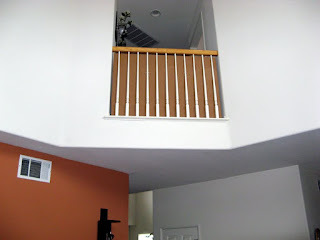 This quick way down might be easier since it is on to carpet, but still quite a scary event. Sure don't want any trips hurried visits to the veterinary office. Kosmo and Kassy received their second KitKnipBox on Saturday. This one has a camping theme. 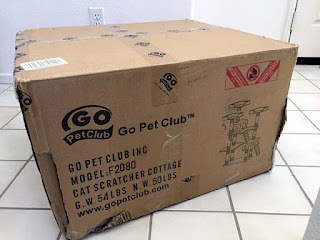 I can't wait until they get their paws on these toys. I am making progress on Kutarug. 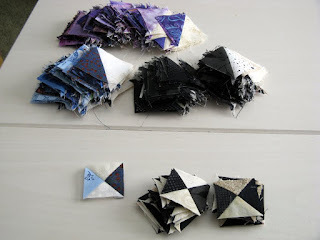 Very slow going trimming down all the unusual sizes one gets from repurposing bonus triangles! Nothing to change my fabric stash this week. I will be moving my UFOs around for a completion in August. Kutarug is far from thinking it could be complete by August's end. I knew this would be necessary since Bonus Triangles aren't exactly any particular measurement. 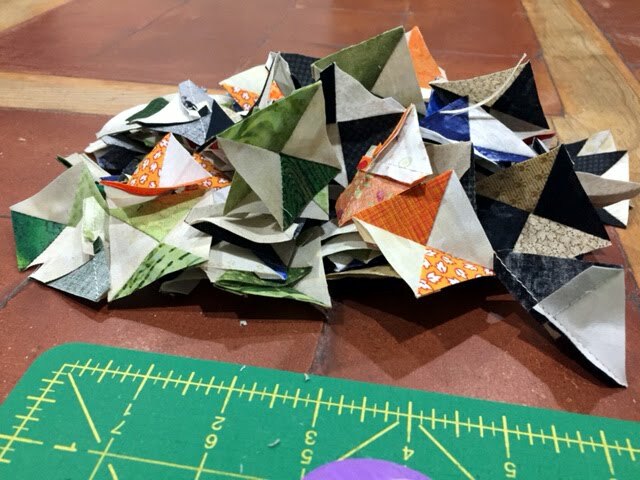 After all they are essentially scraps that many quilters just trash. Not this quilter! So how many do you think my three hours yield? Remember these are 1 1/2" hour glass units at this stage. Well, any guesses? Happy that half of this work week is in the past! 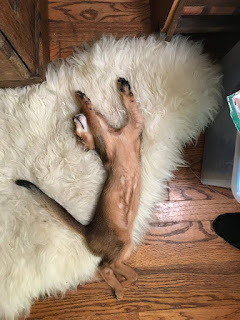 Kosmo at 10 weeks is finding time for sleeping! Some people love dogs. Others love cats. (And either pet can improve your health.) People usually think of cats as aloof and independent. 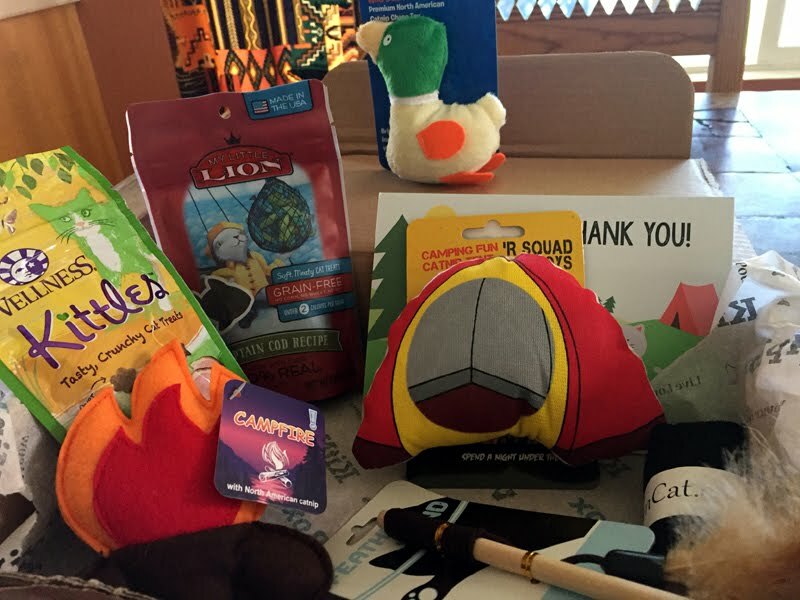 Dog people often prefer canines’ extroverted playfulness to cats’ quiet affection. And people often think their pet choice says something about their personality. But pets and people don’t always live up to the stereotypes. In fact, some kinds of cats act more like a happy-go-lucky dog. Some will play fetch with you. Others love to go swimming. And still others will come when you call their names. Check out these 15 cat breeds that act just like dogs. 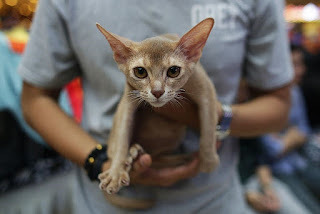 PawCulture reports that one of the best cat breeds for people who are more accustomed to dogs is the Abyssinian. This breed loves water (unlike your average household cat). 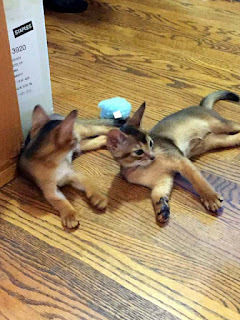 These cats also like to play fetch with their favorite toys. Plus, they follow their owners around the house. They’re also receptive to leash training. The only drawback? Because the Abyssinian needs more attention than other cat breeds, they aren’t the best choice if you need to leave your pet alone often. This is the beginnings of Kutarug. Kutarug is my August 2017 UFO. There is a lot to do for this project; not sure August will be the month it will finish. 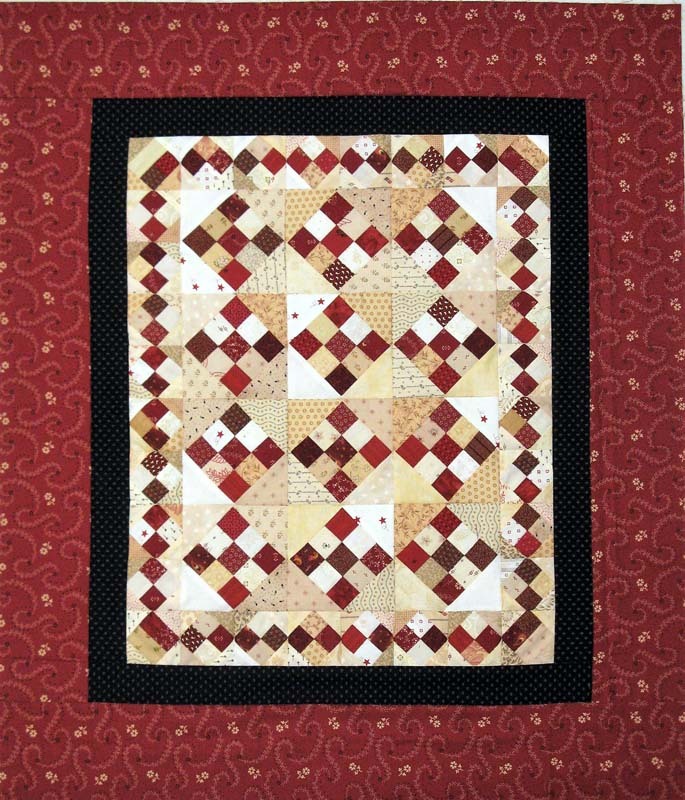 The design is called Winning Combination by Tammy Vonderschmitt. 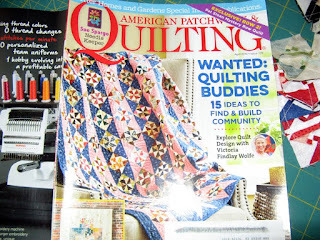 It drew my attention from the cover of American Patchwork and Quilting April 2016 issue. Requirements for the ~ 59" x 81" quilt needs 468 2 7/8" squares that makes into HSTs which goes on to make 234 pinwheel units. 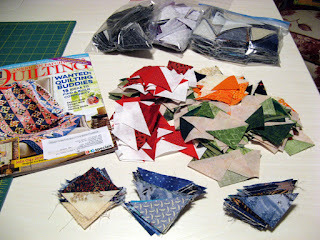 I fortunately have a bunch of Bonus Triangles from various previous projects and the generosity of my friend Debra. Debra gave me a very large bag of HSTs a couple of months back. 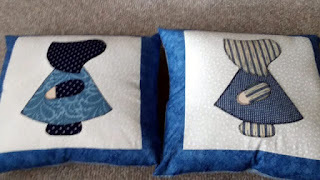 What changes it up significantly is first I will be making my project larger to fit a king size bed AND second my pinwheel units will finish at 2 1/2" rather than 3 1/2". 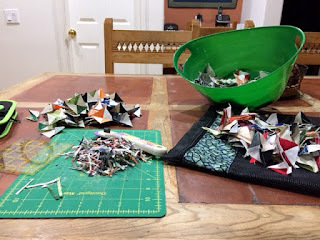 So by now you may have figured out that I need way more than 234 pinwheel units! 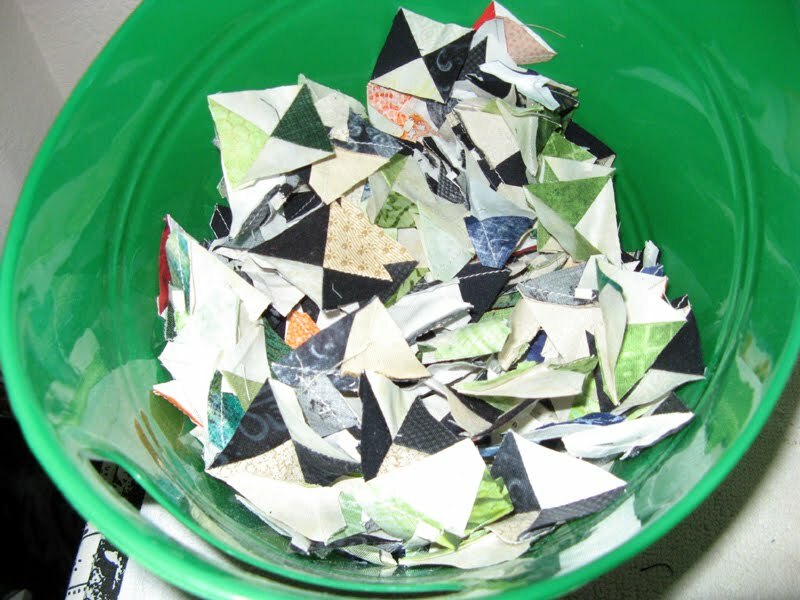 I'm sure to use up all of my Bonus Triangles on Kutarug. 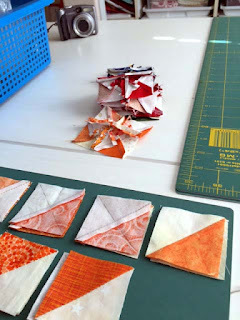 At the moment I'm squaring up hourglass units to 1 1/2". 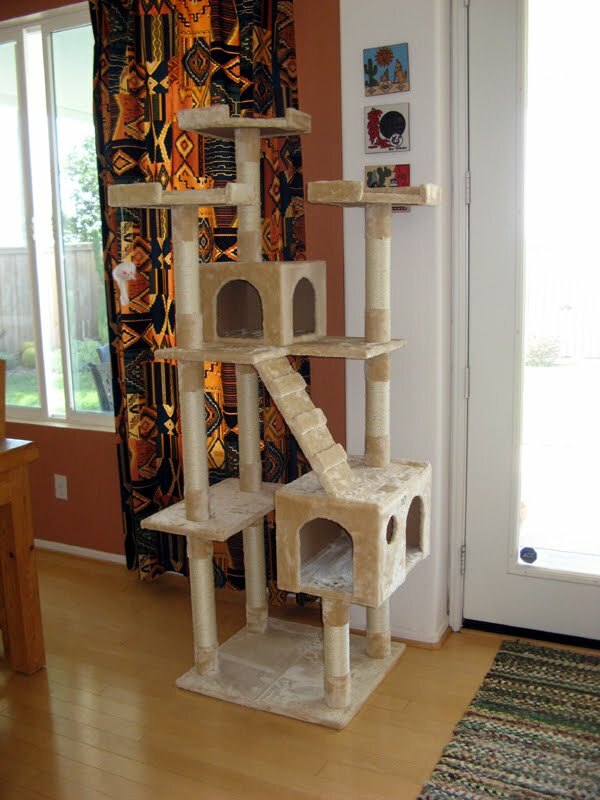 Saturday DH and I put together a cat tower =^.^=. Just a few short weeks until Kosmo and Kassy will be climbing up to look out the windows at the neighbor's bird bath and feeders. Thursday at work there was a drawing that I won. There are some pretty nice goodies in this basket! The blackberry lollipops are a hit right now in the office. I added just a bit to finish Kompass. 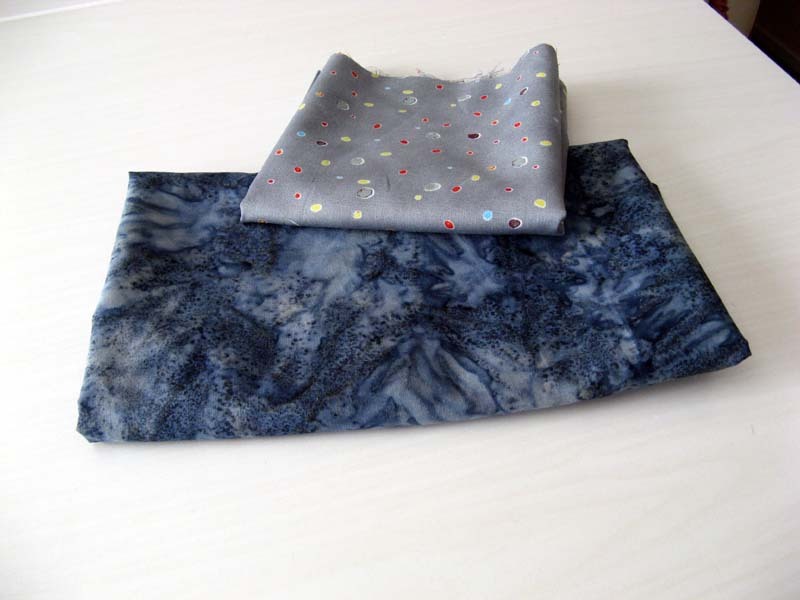 The bottom fabric became the binding. The top gray dot will be for a future project. That future project is Bonnie Hunter's Pumpkin' Patch. 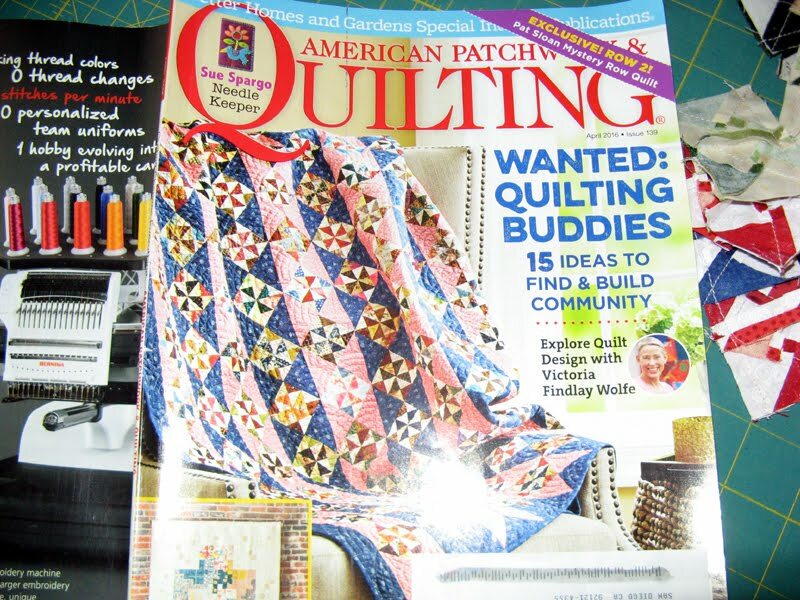 Have you seen it in Quiltmaker Sep/Oct 17 issue? 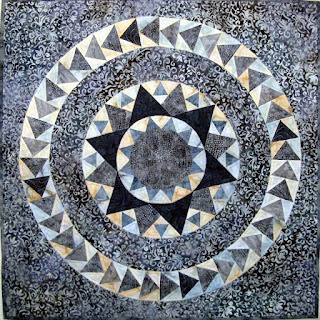 Usage comes from finishing a project started in 2012 with Jo's Country Junction. Each month for the entire year participants were to make one of the 12" x 12" blocks to finish however we decided. 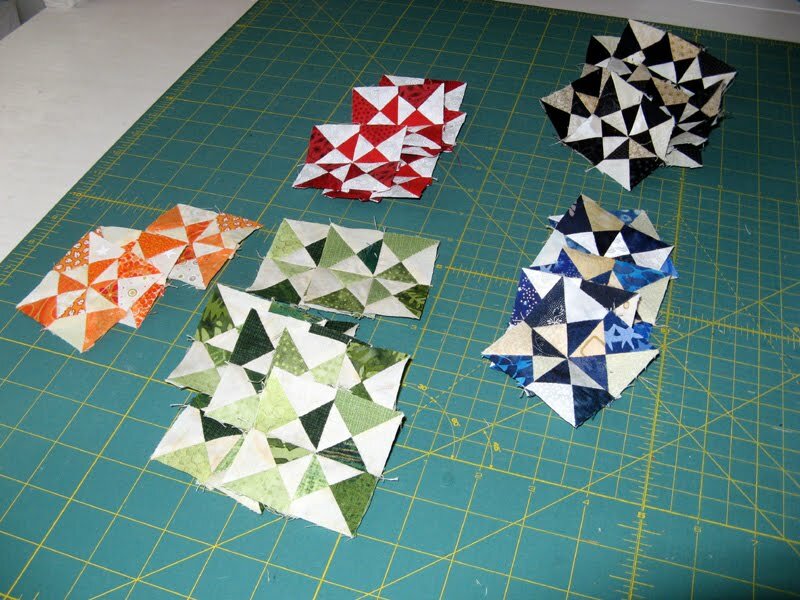 I made three blocks from each of the three patterns by Lori Smith Quilt Squares #1, #4, and #6. This year one of my UFOs was to put these 12 blocks together into a quilt. 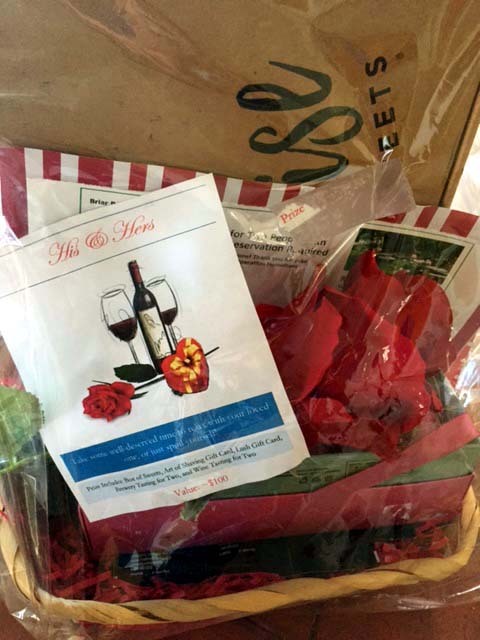 A sashing that worked to bring all of them together was figured out. I thought the green squares pulled it all in pretty well. My plan will be for a blue binding fabric once it is quilted. The blue should pull it in again. 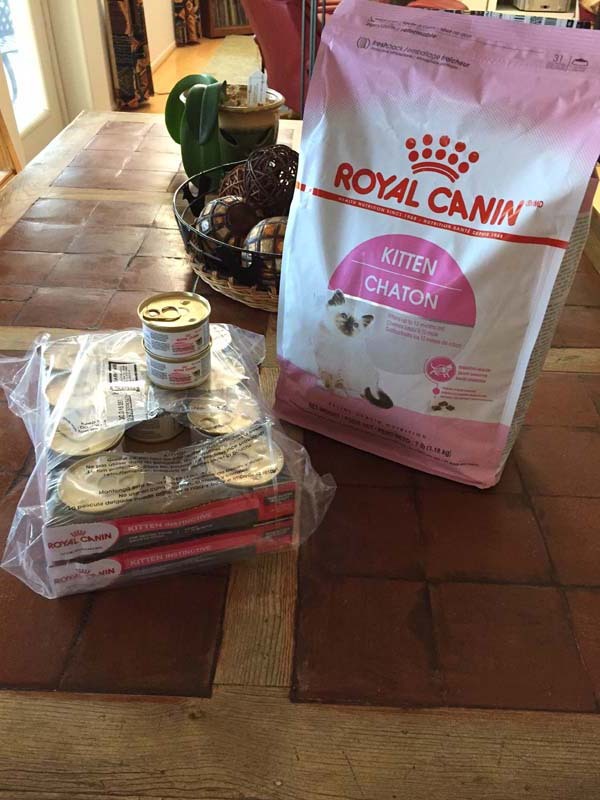 More stuff arrived today for my two new kitties. 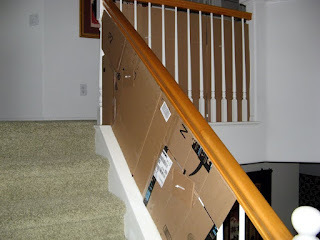 A very heavy box was left at the door which needs assembly. 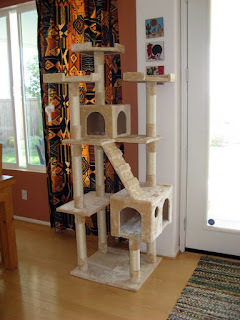 It is the cat tower. I wanted to see how the base would fit the area where it is planned to be located. The color works okay too. I'll be sharing after DH does the work. 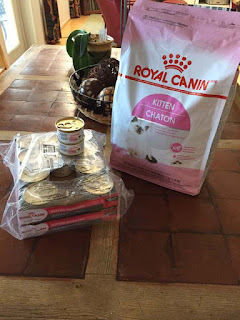 I was told Royal Canin is one of the two foods Lynn has been feeding them. This is not a brand that I could find a my go to grocery store. But of course Amazon has it! These id tags also arrived. They look to be a different color, but they are identical except for the engraved names. I put them on their harnesses last night. They are way to small for collars and will be for sometime. I only used the harnesses when going to the veterinary, which is still the case for Kosmo and Kassy. Dishes are done for the evening. Kompass is calling me in the sewing room. I have two sides yet to bind, a sleeve to stitch in place, and a label to be made. 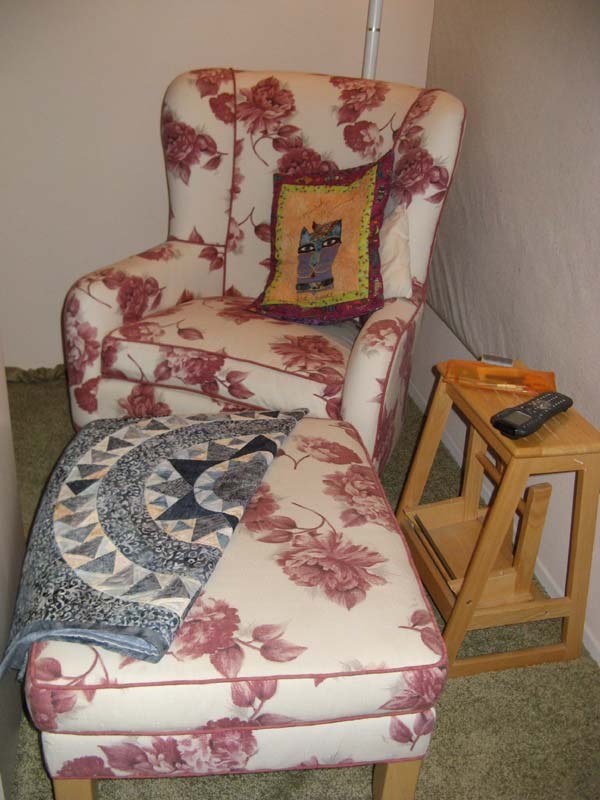 Planing on sitting in my chair moving the hassock close...turning into the Princess Dianna special tonight and getting Kompass done. Kountry Kollection is complete. I've had these blocks since 2012 when I made it as a block a month project throughout that year. The challenge was through Jo's Country Junction making Lori Smith's Designs from her patterns Quilt Squares #1, #4, and #6. 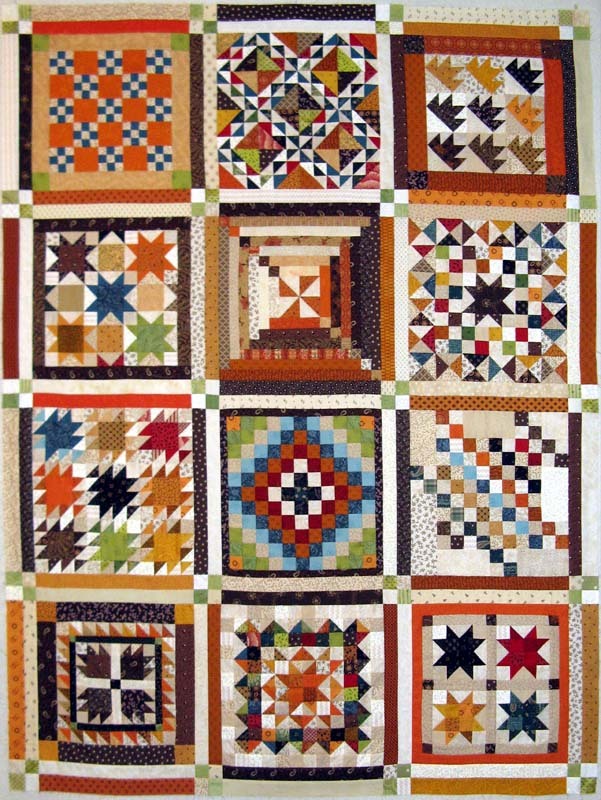 Each pattern came with several block variations. The participant finished each either as an individual or a combination of some or all of the blocks. This year it was way past time to assemble them into a collection. All that was left was figuring out a setting. I like how it has turned out with the sage green and ivoryish four patches. 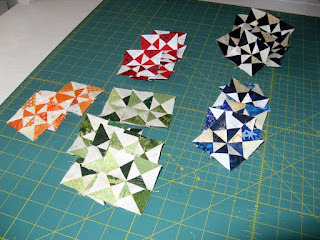 I will be looking for a blue for the binding. Kountry Kollection is #6 on my 2017 UFO List finished ahead of schedule. 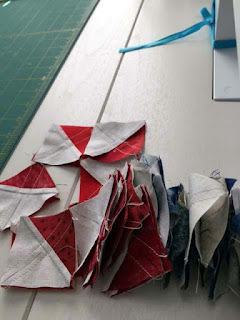 I have also been working on the binding of Kompass. 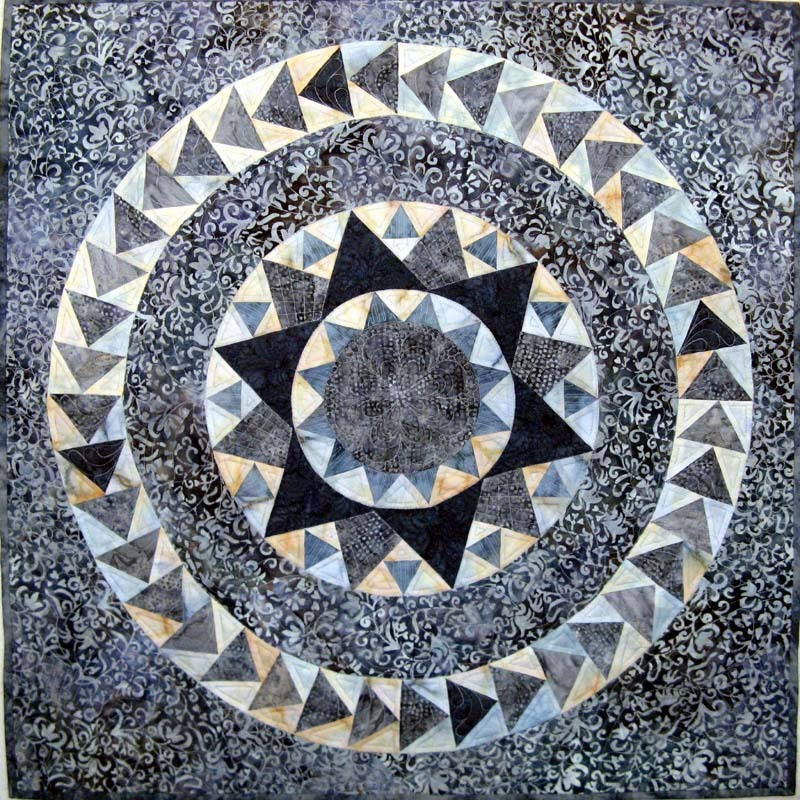 Kompass will be in the San Diego Quilt Show as a judged entry. I am planning on entering it in Road to California as well. Now to get back to Kutarug! 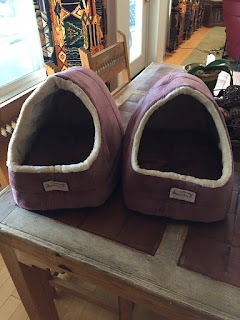 We are getting ready for kitties at our home. Toys came first and now there are beds. 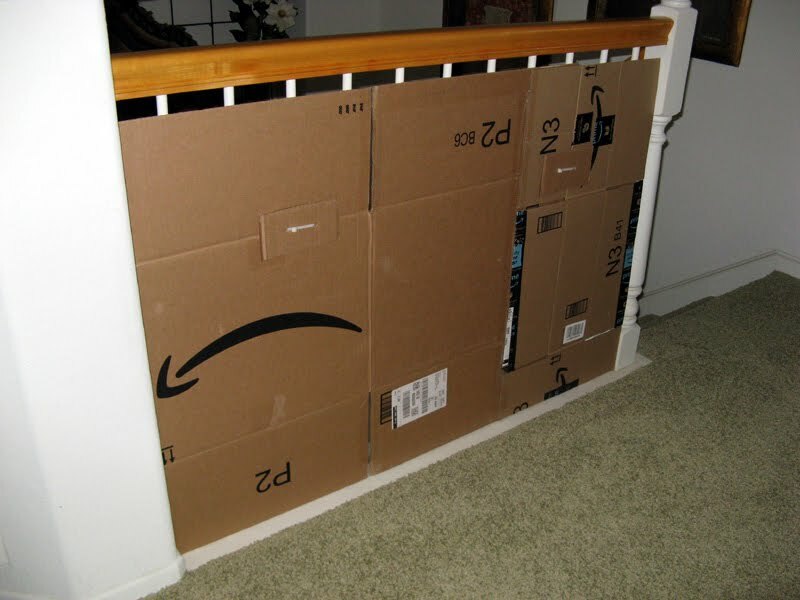 These were purchased from Amazon. They have a removable pad and vinyl bottoms for cleaning should there be a need. They will of course be beds they can use as they grow. I'll bet for a little while they will only be using one bed together. 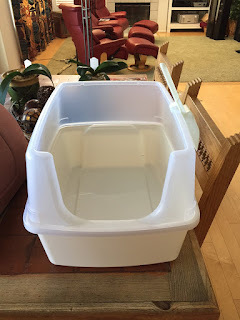 This is a different type of potty than what Kaos and Komotion had available to them. When they were young I had a dome type of cover. Kittens can sometimes be quite aggressive in covering. 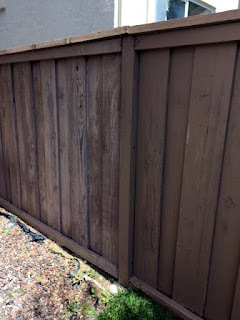 This one has sides that extend upwards instead. 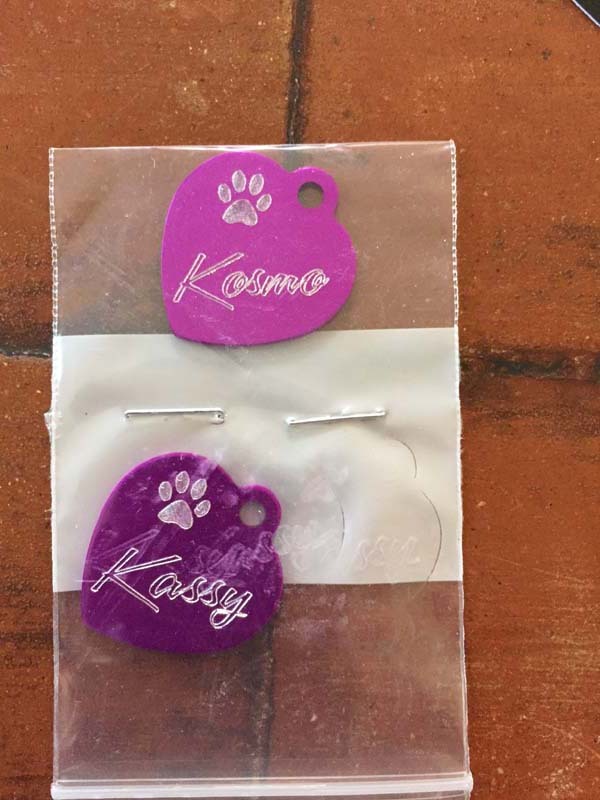 Anxious to see how it works out for Kosmo and Katastrophy. I traveled on Saturday to meet everyone. 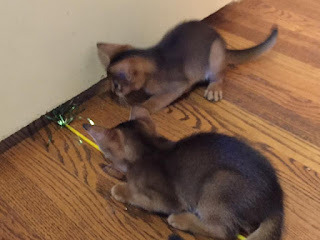 Lynn was nice enough to let me spend two hours with the kittens (there is a third one behind the door). I'd forgotten how little they are at this age. Lots of energy! 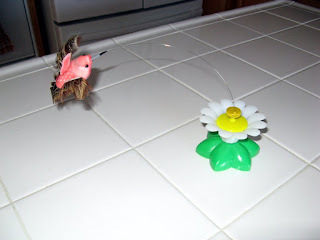 The toy they are playing with is one that I brought up with me. They didn't have anything like it and was it fun for them. Even Velvet (their mom) enjoyed playing with it. We will be kitty proofing the house in the next few weeks. 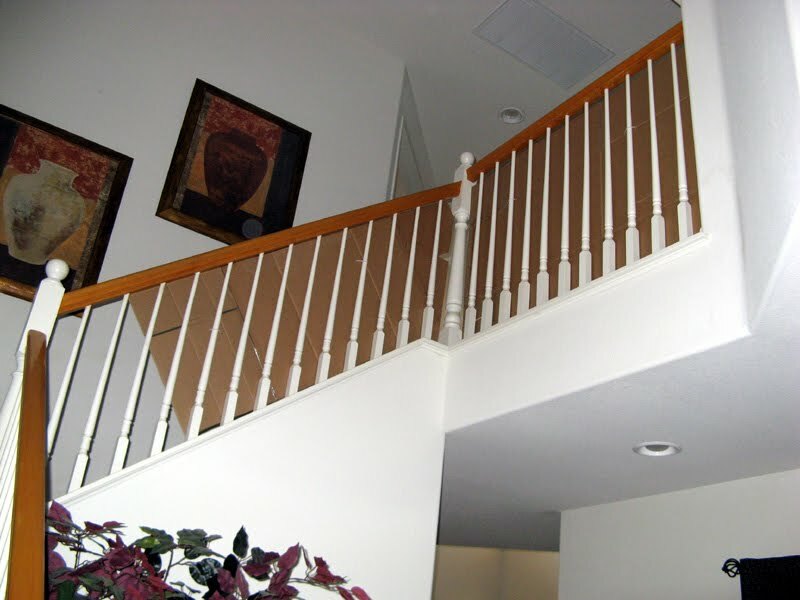 Our second level has some open banisters that need to be covered. We have experience with Kaos and Komotion that took a leap into the family room from there. We thought we had this area proofed with Komotion, but as soon as the proofing was removed another flyer from the second level with him. Going to be trying something different this time and keep it up longer too! As for quilting you may ask...I have been trimming HSTs for Kutarug. There will likely be somewhere around a thousand in this project. I primarily decided to take the project on because of all bonus triangles I have been accumulating from previous projects. 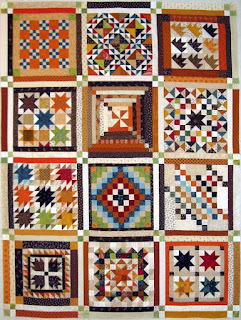 Kountry Kollection only needed sashing to finish; so I've snuck it over the week too. 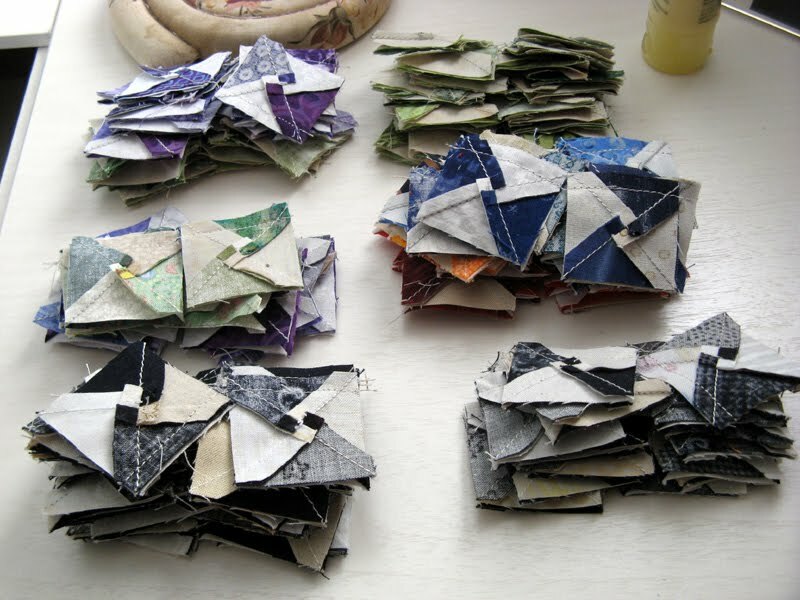 Nothing to change my fabric stash counts this week, but I'm looking forward to the report next week with changes! 2017 UFO #8 was picked for working in August. I plan to give it my best, but I have a busy month planned. The last week of the month will have me at my parents home for my annual visit. I have a stop first for the weekend in Tampa visiting my brother. This project is planned to be king size to fit on my bed. 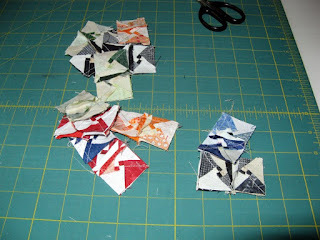 My project will be called Kutarug compliments of my friend and follower Janet O. 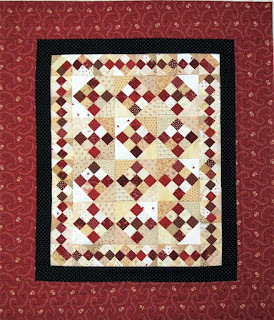 The design is called Winning Combination by Tammy Vonderschmitt from the publication American, Patchwork & Quilting April 2016. 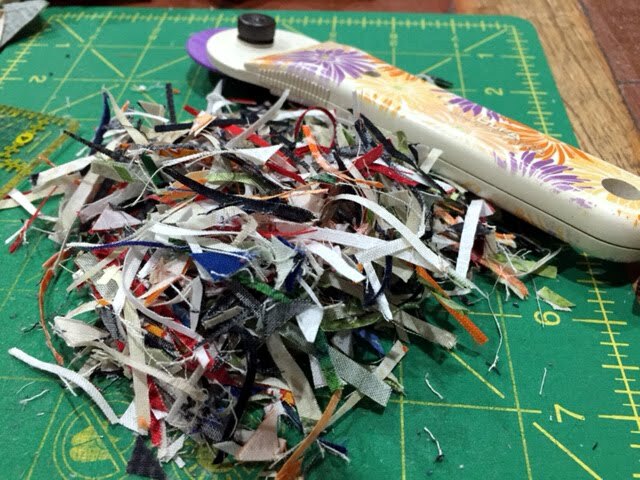 As you can see many HSTs are made. They need to be trimmed up with the Bloc-Loc ruler. 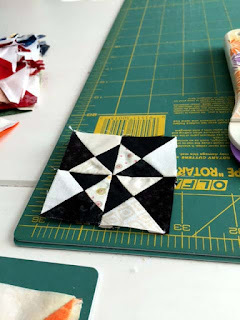 Thanks to Bonnie Hunter time and time again for showing bonus triangles! I will undoubtedly need to make lots more.